Trametes versicolor. 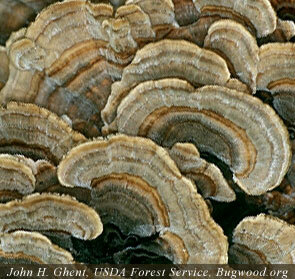 It’s better known by its common name, turkey tail. Looking at the colors and pattern of the fruiting bodies, it’s easy to see the resemblance, making it the perfect way to say “Happy Thanksgiving” from Plant Pathology. Turkey tails are found in Ohio, and throughout North America, on logs and wood (they are important decomposers > More info). This fungus is also a bit famous for its anti-cancer properties. An internet search for “turkey tail funugs” will return several articles in this regard. I found a good article with career advice centered on Katniss Everdeen, the heroine of the Hunger Games. As academic coordinator in the Department of Plant Pathology, I often help students with career advice, so it was good material to post on my office door (e.g., it’s good to volunteer, be a strong leader, etc. ).